The Downton finale: Sir Richard vs. Matthew. What kind of monster prefers Sir Richard to Matthew? Best Downton episode ever? I say indubitably yes. From the moment a special new title sequence tracked the arrival of that magnificent Christmas tree, I was hooked. And the snowy kiss that capped it off was everything I’d hoped for. I didn’t realize that British Christmas specials are allowed to actually advance plot arcs. When American TV takes time out for a holiday episode, it’s often a fun little diversion that unfolds in a vacuum, outside the bounds of the show’s main narrative. Not at all the case here! Lots of important stuff happened! For a moment, it appeared that Lady Mary might be coming to America. I will admit that I had visions of running into her on the streets of New York late some night as she took a break from filming. We’d stroll past the velvet rope at a club (she’s an aristocrat, after all). I’d bribe the DJ to drop the needle on Zip! Goes a Million. And as we Dougied together I’d assure her that the unfortunate incident with Mr. Pamuk was ancient history and of no concern to me. Besides fulfilling the wildest dreams of Mattharyans everywhere, the Downton finale offered other major developments. Sybil is now married and pregnant, with Lord Grantham grumbling that he’s “to have a Fenian grandchild.” I notice that, like Lord Grantham himself, the show did not deign to attend Lady Sybil’s wedding. Far too downscale an affair for Julian Fellowes to bother with, I imagine. Lady Edith is in hot pursuit of the enfeebled Sir Anthony. I have finally come around on poor, trod-upon Edith. My heart broke a little when she vowed to continue her chase by saying, “If you think I’m going to give up on somebody who calls me lovely …” I’ll call you lovely, Edith. You can drive me around Yorkshire in an open-top motorcar any time you like. And of course Mr. Bates’ march to martyrdom continued apace. When will the poor fellow stop enduring punishments? It’s like The Passion of the Christ in very slow motion, with a wool topcoat for the crown of thorns. Also: It seems the Crawleys choose their lawyers just about well as they choose their doctors. What’s the 1920 version of Yelp? So, Dan and June, are you satisfied with that ending? Will it tide you over until Season 3 and the debut of … drumroll … Shirley MacLaine as Lady Cora’s American mother? 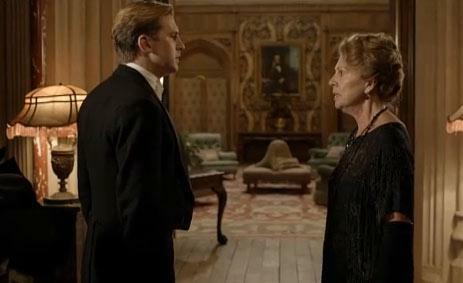 There are few things in life I’m looking forward to more than her scenes with the dowager countess.